Alex joined us in January 2016 for the Courchevel Residential BASI 1/2 Course and loved every minute! Being at about 1300m in the picturesque village of Le Praz, this was a daily occurrence for me for the 10 weeks I spent on my BASI Level 1 & 2 course. Given the imminent prospect of another day spent skiing I never stayed bleary for long: by the time I wandered into the living area of our spacious catered chalet, breakfast would always be well under way. Around the breakfast table the daily patter of assorted banter and in-jokes would start. Naturally nobody else thought we were funny, but truth be told I have never encountered a group of people that laughed so much both at and with each other. Whether it was because we found out that Luukas’ mother had forced him to wear a slalom face-guard for recreational skiing until he was an adult, or because George had a laugh like a girl and Izzy had a laugh like 40 year old man, there was never a dull moment. After checking that my roommate, Tom, was alive (vital signs include Justin Bieber’s ‘Sorry’ coming from the shower room) I would head down to our boot room: it was a large room that we managed to make appear small due to our shocking inability to organise our skis. George would be stood by the door like a dog about to get its walk and Tom might have finished his shower… we all live life in different ways. Once we were ready to go, it was up the Praz bubble and into the centre of Courchevel. Depending on whether we had a morning or afternoon session with Gareth would determine where we went first. New Generation has an office in Courchevel 1650, a resort which is accessible from the rest of the resort by three lifts. It has some of the best off-piste skiing in the resort in my opinion and also some brilliant long blues and reds which are ideal for training at BASI 1 and 2 level. The fact that it is slightly off the beaten track means that it is generally less busy too. Gareth, or ‘Snowda’ (as in Yoda but for snow…get it) as we sometimes called him, is a short man from the Wirral who is a massive geek and annoyingly good at everything. It seems up for debate whether he is more proud of being a BASI Level 4 or of briefly holding the top bowling score in Courchevel. An example session could be to have a quick warm up off skis, then go for a cruise building in some generic exercises such as skiing on one ski, or doing jump turns. We’d often head to the piste ‘Granges’ and practice some carve (long) turns. A visit to a gentle run to work on some central theme technique or maybe have someone deliver a mock lesson was common and although it sometimes seemed monotonous, Gareth was good at making us see the relevance of it, and was very good at structuring sessions so that we worked on all aspects of our technical skiing and teaching without getting either bored or too fatigued. Over the course of the 10 weeks Gareth could not have delivered better structured or delivered preparation for the various modules of the BASI exams, but if the snow had come down heavy the night before he wouldn’t hesitate to take us to some great spots to play in the powder, or even ski us over to Val Thorens! Gareth is a fantastic coach and everyone could definitely call him a friend well before the end of the course. This was a guy who took time out of his schedule to ski with us for fun! He even serviced our skis for us during BASI exam weeks while we received off-snow training from our trainer, so that we could roll into the next day with a good head on our shoulders and sharp skis under our feet. The atmosphere in Gareth’s lessons was lighthearted but focused. Sure, TongTong (aka the Tongahawk missile) liked to crash into random skiers, and un-clipping someone’s bindings then pushing them over will never get old, but within the group there was a clear desire to succeed and make the most of training. Our course were probably the swots of the snowsports world as we were on time, we were physically prepared and did plenty of training outside of dedicated lesson time but this only made the course better. Outside of training time there were plenty of powder day shenanigans, lengthy visits to Le Pub Ski Lodge (aka Slodge) in La Tania, manic tree runs, tobogganing, impromptu yoga sessions and I even forced George to take some touring skis up a hiking trail. It is also worth pointing out that in addition to all the skiing and leisure activities we did in our free time New Generation also laid on a decent range of other training. 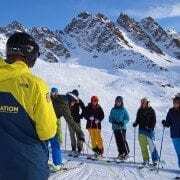 There was mountain safety where we got shown how to assess for and deal with the fallout from avalanches, race training and also weekly French lessons which were honestly so much more fun than I could have expected. At the end of a day Gill and Holly would have cooked us up a delicious two course dinner and this really was a sort of family event. The banter was incessant, several people nearly choked to death (from laughing, not the food) and more than once someone ejected their drink out of their nose. Despite the fact that we spent the majority of every day in each other’s company we always had something to talk about. All in all not bad considering we were all strangers to each other at the very start of the course. After dinner we would sometimes head out the nearby bar, particularly if it was a live music night. The nightlife in Courchevel isn’t wild but it is fun and friendly and more affordable than I expected. Also, I wish I could show you the pictures of the sleeping positions that Luukas was found in after a big one at the Pizzeria but I don’t think that’s the sort of publicity New Gen is after. Often, though, all we wanted to do was relax, carry on chatting and go to bed in order to be as ready as possible for the next day. If you want this winter to be your best ever, sign up to a Residential BASI 1 & 2 Course now!